Winter has come to Cranberry Cove and Sassamanash Farm. I loved all the colors of autumn and the brilliant reds and pinks of the cranberries in the bog, but winter has its own charms. The pastel colored shops on Beach Hollow Road are dusted with snow creating a fairy tale effect, and the waves on Lake Michigan are stilled and frozen into spectacular shapes. My half-brother Jeff, who owns the farm, has flooded the bogs to keep the vines warm. I know, that sounds contradictory, doesn’t it? But the water turning to ice creates heat and protects the vines. He will be sanding the bogs as soon as the ice is thick enough—it needs to be a good two to three inches. The sand will sift onto the vines as the ice melts. It helps to kill insects and keep the weeds down when spring comes. I’m enjoying life in Cranberry Cove. I’ve joined the book club at Book ‘Em that Greg Harper started. He’s the owner of the store and even though he’s often as disheveled as his stock—his hair tousled and dog hair on his sweater—I find him very attractive. We’re not actually dating, but we’ve spent time together which I’ve enjoyed greatly. We’ve both lost someone so we are taking our time getting to know each other. Time for me to get baking! I make cranberry scones, breads, muffins, coffee cakes and salsa for the Sassamansh Farm store. Talk to you soon! Patricia, I'm sure Monica would be glad to whip up some cranberry scones for you! I'll take some cranberry anything, Monica! And what a great cover. I've attended the Cranberry Festival in Stone Lake, WI quite a few times. Always a fun time and some great food and recipes! I will be looking for this book for sure! I love the cover. It draws you in! I can't think of anything better for breakfast then cranberry scones or muffins. Looking forward to reading this book. What a gorgeous cover and great premise! Cranberries! One of my favorite foods! It sounds like a wonderful series and I look forward to reading it. And, while I'm reading it, I'll nibble on a mixture of dried cranberries and nuts! My favorite snack! Cranberries are one of the foods you either like or you hate. Personally I love cranberries. I put them in my oatmeal, stuffing, in cookies and in bread. 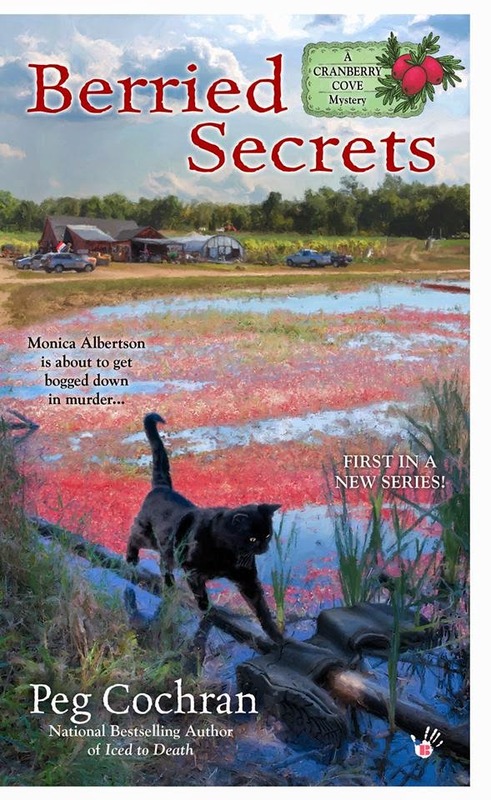 I love the cover in this book since there is a black cat on it. Would love a copy to read.